My best friend woke up to a new baby on the farm and I just wanted to share the picture with you. 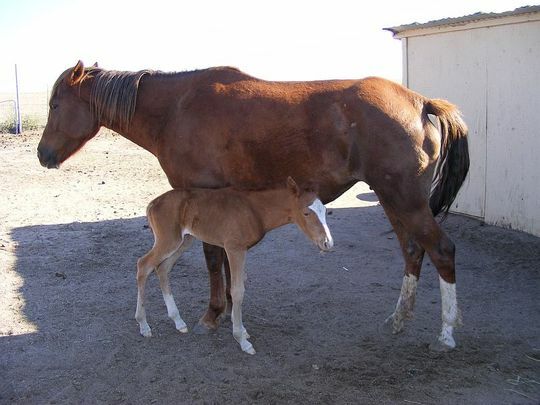 The Mother is April, and she named the little filly Ricochet. My friend had worried about the mare becoming a Mother for the first time and had plans to bring her in the barn tomorrow and watch her around the clock, but Momma had different plans and didn’t need any help. I hope both mother and baby are doing well. It's wonderful to see a new birth. What a lovely photo - thanks Harli and all together - AAAHHHH! A lovely photo.Thanks for sharing it. MERRY CHRISTMAS TO ALL MY NEW FRIENDS!